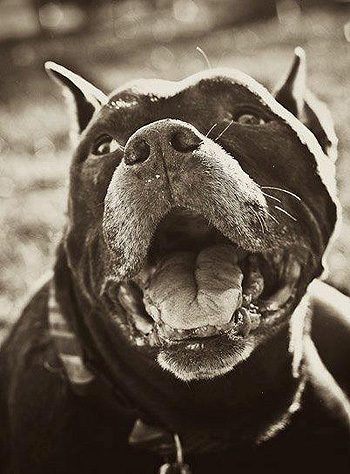 What Are the Pit Bull Stories that Inspired You? 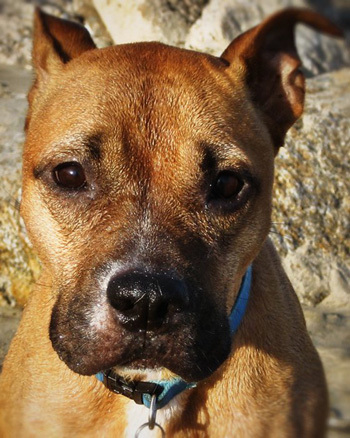 Whether it was Patrick, the Vicktory Dogs, Jagger or other dogs who were rescued from fighting, the resiliency and loving nature of the pit bull was at center of all our inspirations. Thanks everyone for sharing! Number one is Patrick (above)and I believe the next is the wonderful rescue of the victims of Michael Vick. I am awed by Tia and the gang from Villalobos Pit bull Rescue moving 200 pittie babies from California to New Orleans and also opening a sanctuary in New Mexico. I think all the heartfelt and warming stories of how pit bulls and their supporters are overcoming the odds and the stereotypes are amazing. 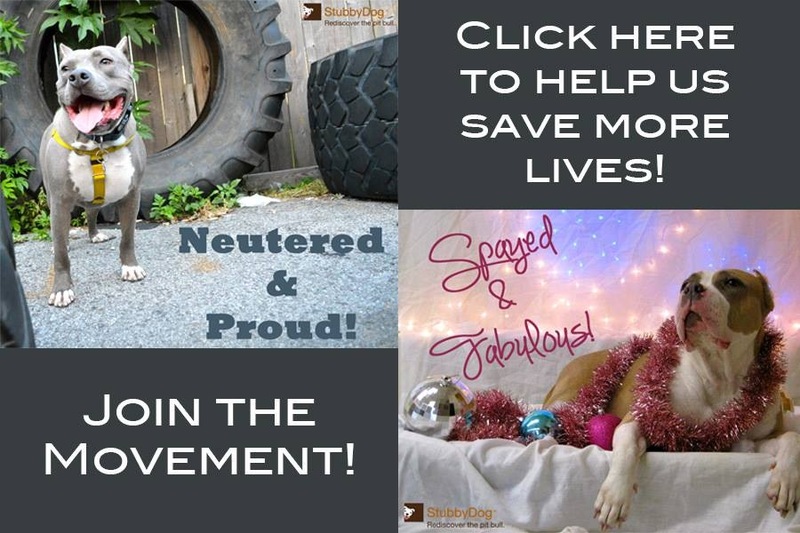 They touch my heart as a dog lover, pit bull supporter, and dog business owner. I only hope that next year brings even more tolerance and understanding then this year did. The ones that touched me the most were the ongoing stories of the Vick dogs as they are rehabilitated and prove every day that victims of dog fighting can be saved. I also was touched by the Turning Tragedy to Triumph Story. And, sadly, on a local scale the story of Ace — the scared pittie found in an Ace Hardware here in Detroit and put down by Detroit Animal Control really touched me and galvanized me to support those who are working to change the policies in the city for the better. Patrick and his unbelievable will to survive. 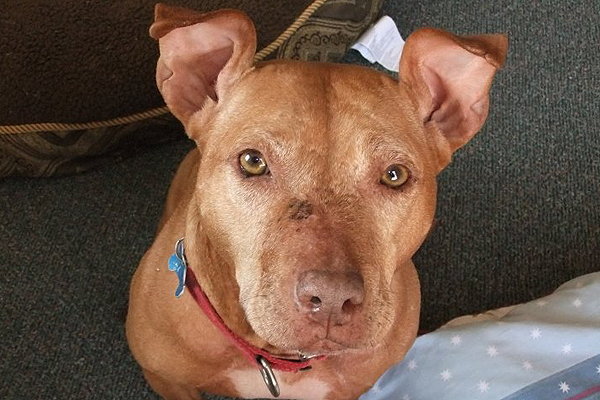 Often there are so many sad, heartbreaking pit bull stories. The ones that stand out to me are the stories full of hope and triumph, the ones that while reading I often find myself shedding bittersweet tears, like Enzo’s story or really any of the stories in StubbyDog’s Second Chances. 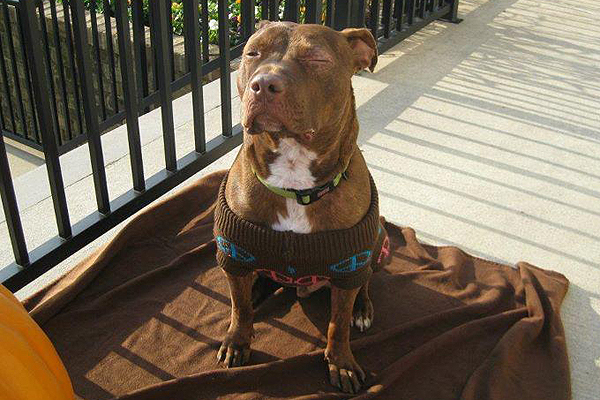 I also loved following Justice for Bubba, rejoicing when he found his forever home. 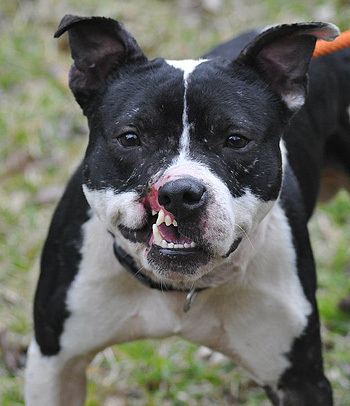 Lastly, the stories from rescues of alleged/suspected dog fighting rings will stick with me, as a reminder of how much work needs to be done, and how much work is being done. 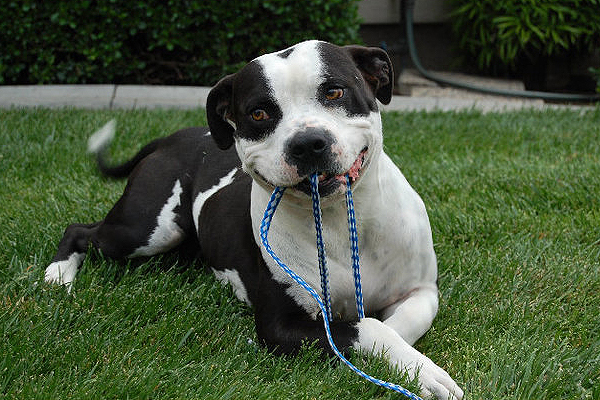 Handsome Dan – the Vick rescue. Harper from Dolly’s Foundation, the support Patrick received from the animal community. Also, Little Red (above) going to her forever home. 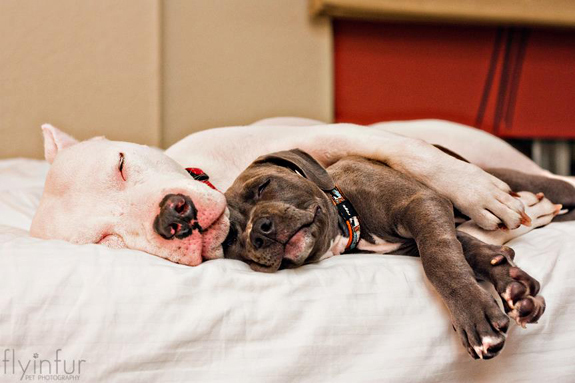 Every story I read about pit bulls touches me in a way no other dog story can. I look at my girls and can’t figure out how any human can look into those eyes and hurt. You guys at StubbyDog, Our Pack, Bad Rap, all of the rescues out there, should give yourselves medals. You have opened my eyes to the world and what is going on in it, so much so that my goal is to someday open my own rescue. Thank you for who you are all of you and what you do. So many of us are more educated and knowledgeable because of your work. And so many innocent pitties have been saved. God bless Patrick, forever Johnny Justice, Little Red and Audie, RIP Leo …just to name a few of the many ambassadors of the wonderful breed (mixed or not). I love it so much when I read a story about a pit bull that no matter how they’ve been treated, they are still capable to trust humans. I was very touched and saddened, by the passing of the wonderful Sarge Wolf Stringer! His story and his life are wonderful tributes to pit bulls that may not have a great start but can turn it around and accomplish much. The tribute written by Sarge’s Dad was amazing! Stories like Patrick and Harper are sad, yet inspiring but, I would say adopting my dog would be the best in my opinion! I am always impressed by the stories about pit bulls that have gone beyond being abused or neglected and still become loyal, loving pets. I loved the story about Shaka, the dog who was on death row and ended up in law enforcement. All the stories make me cry! Hands down, Harper, the puppy that Dolly’s Foundation rescued. She was tossed away in a trash bag, paralyzed, until Dolly’s Foundation put her through intense physical therapy and overhauled her immune system with good nutrition. Patrick! Most powerful and amazing recovery. The story of Mr. Buddy Rose! Besides my own story, LOL, I can’t pick a favorite! I love them all! The story that really impacted me in 2011 is Jagger’s story. It’s the one that I carry in my head and heart as a reference point for why pit bull advocacy work is so important and keeps me hopeful for the dogs – it reminds me that there are really good people out there who are working overtime to give victims of dog fighting the second chance they deserve. Two of my other favorites: the tale of Mr. Buddy Rose and the story of sweet Hope. They inspire me in the same way. For sure the stories about the Vick dogs. I remember seeing the show “Dog Town” in particular Georgia. Her story was so sad..and then she finally got the chance to get adopted. But, Patrick was by far the most inspiring. That these dogs can come back as such examples of hope in spite of what we humans do to them. Thanks Stubby Dog..you too are a true inspiration in your promoting what these wonderful dogs are really about. They are all inspiring to me, and of course, I love this loyal breed!!!! As long as I live, I’ll remember the story this year of a pregnant stray pittie who wandered into a woman’s yard and dug a hole near a tire of a car to have her puppies. The woman chained her so she wouldn’t end up in the road and hit by a car. The dog delivered the puppies and was gentle with the woman who checked on her. She called Animal Control for help and they came out and shot her, a gentle mother on a chain with puppies. The mentality of some people and the bias against these dogs makes me ill and even more determined to help when and where I can. She wasn’t linked to dogfighting, she had no pleas from people trying to get her out of a shelter, she was just a little pregnant dog alone in the world and was subjected to that. I’ll never forget her. @Greyglo OMG please tell me that she survived along with her puppies. I”m so upset I wish I hadn’t read your comment (it’s not your fault) when I hear stories such as this my blood boils over. Animal Control actually shot these dog with her pups there. I pray the woman who called animal control saw this and reported the idiot. There is a video there. The dog and her puppies didn’t survive. @theprettychic Amen to that Kelli! You can follow Sway’s legacy on this page: http://www.facebook.com/swaylove where Josh works tirelessly to get dogs off death row and into loving homes.